Oregon State hosts two Career Showcases each year in Portland which cater to students in the post-baccalaureate computer science program. Last week I attended the fall 2017 edition. Here’s a bit about how it went and what I learned. I also attended two non-company sessions, one on attending Oregon State’s graduate school and another which was supposed to be a kind of mock interview. In preparation for the event, I printed out about 30 resumes (a dozen would’ve been fine) which I’d honed over the course of applying to a bunch of internships this fall. I also brought along a notebook and a pen. We also had the opportunity to make a poster about a school or side project. I’ll get to that in a bit. Thanks to an active Slack group, a bunch of people who were attending the Career Showcase met up at a place in downtown Portland called the Pine Street Market. It was my first time meeting many of them, and it was fun to connect faces to screen names. Another benefit to meeting up before the event was that it provided a good opportunity to break the ice before the event itself. Walking into a convention hall filled with strangers is much less intimidating if you’ve already met a bunch of them over a bowl of ramen and a beer. The event was held at the Embassy Suites in Tigard, which is about a fifteen minute drive from downtown Portland. It was your typical hotel event space: big open room with tall ceilings, continental breakfast and drinks, those metal-framed chairs with beige padded seats, etc. There were tables around the outside of the main room and then a lot of chairs set up facing one direction in the middle. In the hallway outside the main room were the project posters. More on that below. After signing in and having a chance to eat a bagel (it still blows me away that there are people who would leave the house without eating breakfast), the students sat in the middle of the room while Oregon State employees stood around the edges. Bella Bose, the Interim Head of EECS at Oregon State and Karti Mayaram, the temporary head of the online program, were there, along with a handful of instructors and program coordinators. Off the top of my head, I recognized Tim Alcon (CS 161), Stephen Redfield (CS 271), Justin Wolford (CS 290 and CS 340), Benjamin Brewster (CS 344), Padma Akkaraju (program coordinator), and Tina Batten (program communications). Each of the employees shared something interesting about themselves and then the microphone came to us, the students, to do the same. It seemed like it would take all of us (90+ in total) an hour, but it actually went pretty quickly. I even managed to connect with someone who shares my passion for fermentation. The next session was centered around collecting feedback about Oregon State’s post-baccalaureate program. The students broke out into groups of about a dozen and an Oregon State employee joined each group to ask a variety of questions. I can’t remember the details of everything we discussed, but two things that came up were the value of the Slack group (and why Oregon State should pay for the premium version) and elective courses (more variety, please!). After that we listened to a panel of former students talk about graduating and working as software developers. Perhaps others found this useful, but if I were to cut anything from the Career Showcase this would be it. A lot of information from the panelists was either too general or too specific. Were it up to me, I’d find a particular graduate to deliver a prepared, short talk (ten or fifteen minutes?) on a specific subject, like technical interviews, or networking, or maintaining side projects. Sort of like a TED talk. 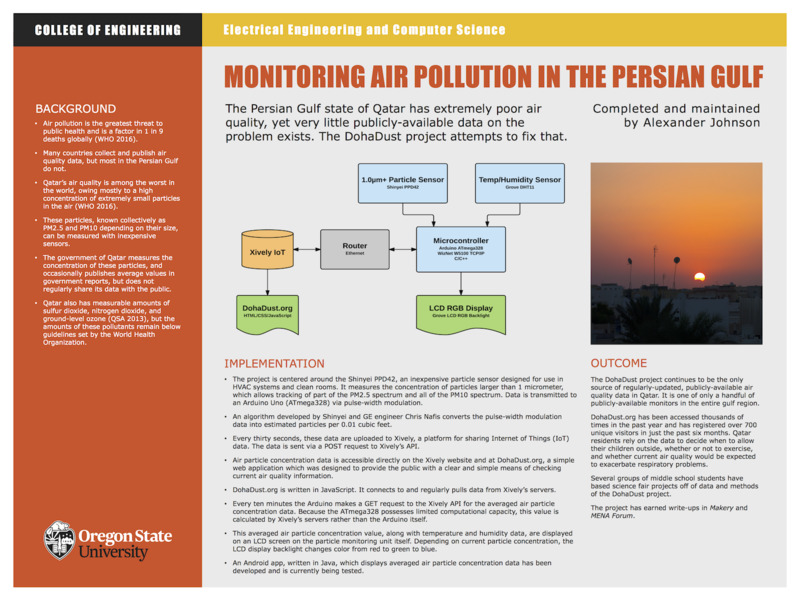 The poster I prepared for the Career Showcase summarized a project I’d completed which focuses on monitoring air quality in the Persian Gulf. A few weeks before the Career Showcase Ben Brewster said on Slack that not enough people had prepared posters showing off their capstone projects. In order to fill out the poster session, he opened it up to anyone who’d completed any sort of side project, whether school-related or not. I knew immediately that this would be a perfect time to showcase a project I started while I was living overseas. Long story short, I made an air quality monitor with a microcontroller (Arduino) and connected it to the internet. Although I’ve since passed on the project to another engineer in Doha, this was a major hobby of mine for several years. If you’re curious, you can check out the air quality in Doha, Qatar is right now. Showed my long-term interest and experience with low-level programming, hardware, and environmental awareness. Different than other projects I looked at in that it’s a real-world project that’s attempting to solve a real-world problem. I could talk about the project and air quality in general for hours, so I felt very comfortable talking with people about my poster. This turned out to be the best part of my Career Showcase experience. Several employers stopped by to talk during the poster sessions, gave me business cards, and asked me to follow up later. One of those conversations eventually led to two interviews and an internship offer. More on that in another post. If you have the opportunity to make a poster for your capstone project or another project, do it! The round-robin company sessions were hit and miss. For most of them, there were four or five students pulling up chairs to a table to talk with one or a few representatives from the company. Some of the company representatives were formulaic and made sure to talk to each student in turn, while others just let the most vocal students take over. In some groups I was that vocal student, in others I felt like I barely had a chance to ask questions. I’m not sure how to do this better, but I am sure that there must be a better way to do it. Qorvo (semiconductors), NWEA (education), and Iovation (security) did a great job of presenting their companies and talking with candidates. On the other end of the spectrum, IBM and Garmin were a bit of a letdown. The IBM representative seemed more interested in talking about the good ol’ days of computing than about current and future job opportunities. Garmin had been high on my list for an internship, but the representative I spoke with didn’t seem to know a lot about the internship hiring process. Ideally, a company would have an engineer to talk about the work and someone from human resources to talk about open positions and the hiring process, but I understand that that’s not always possible. One company I’d signed up for (Cloudability) failed to show up at all. One of the Career Showcase organizers said that they had a very good explanation for their absence, but I think it still looks bad for Oregon State and the company. In addition to the company sessions, I signed up for one on the Graduate School and one on interviewing. I was honestly most excited about these sessions. Unfortunately, they were both a bit of a letdown, too. Rather than being hosted by an Oregon State professor who teaches in the graduate school and/or supervises doctoral candidates, the session was hosted by an instructor who had started but not finished a graduate program. This isn’t a problem in and of itself, I suppose, but I felt like speaking with a professor (and potential advisor) would’ve been more valuable. The mock interview session turned into a resume review session. This could’ve been helpful, except that the person conducting the session had already been gracious enough to review my resume via email a few weeks prior. In retrospect, I should’ve demanded a mock interview (“I demand a mock interview!”) because of how valuable an experience it would’ve been, but I was sharing the session with another student and didn’t want to impose.